Now open at the earlier time of 6am, Mon-Fri! Regular trade and retail customers visit the team at Battersea for the service and great product choice. We carry wallpaper, various trade and designer paint brands, and assorted decorating sundries and essentials. 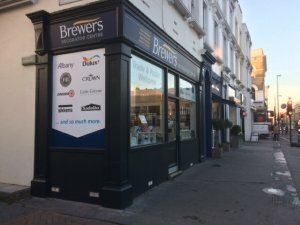 Of course, you can also order from the entire range online if you have a Brewers account and have your preferred products delivered to store. Our team has been here since long before we became part of the Brewers family, so there’s more than 25 years of decorating expertise to help you narrow down your many options. Dulux, Albany, Crown and Johnstone's are all mixed in-store while you wait, plus you'll also find Farrow & Ball, Little Greene, Mylands and Paint & Paper Library in stock. Our Park Paint Decorator Centre in Battersea is worth a visit for its unique art deco windows alone – they’re the only ones of their kind in London. The store is actually featured in a Tower of Babel installation at the Victoria and Albert Museum in London. You’ll find the real thing on Battersea Park Road and Latchmere Street, not far from the southwest corner of Battersea Park. There’s short-term parking right outside. Should you happen to be coming by bus, the stop to get off at is The Latchmere (numbers 49, 344, 345 or 319 from Clapham Junction). Keep an eye out for Travis Perkins as we're close by. Travelling on Battersea Park Road, the store is on the left before you reach the junction with Battersea Bridge Road and Latchmere Road. Travelling from York Road on to the Battersea Park Road, cross over the junction with Battersea Bridge Road and Latchmere Road and the store is ahead on the right hand corner.